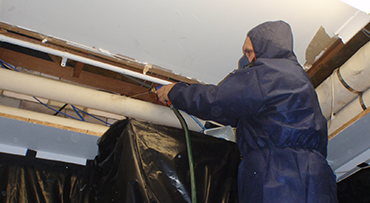 With over 55 years of experience in the asbestos removal trade, Stormont Service provides a comprehensive service package to residential homes, commercial buildings and industrial sites. From asbestos inspection and asbestos assessing to asbestos testing and highly effective asbestos removal – we do it all in a hassle-free manner. You can just sit back and relax, as we will provide you with detailed asbestos assessor reports in Central Coast. In the Australian Capital Territory, asbestos identification, air monitoring, risk assessment, auditing and asbestos removal clearance inspections can only be done by a licensed asbestos assessor. At Stormont Service, we have a SafeWork NSW certified asbestos assessor [License No. LAA001317]to handle the above-mentioned tasks and other asbestos assessing procedures. All the results are collated to develop an in-depth report. The report includes the scope, survey summary, registry, and priority rating. Samples collected for testing are sent to a NATA accredited laboratory and all the findings are fully documented and loaded in our database for future reference. We give you detailed asbestos assessor reports in Central Coast containing all the information that can be used to safeguard people in the vicinity of asbestos containing materials. Contact Stormont Service today if you need assistance from a licensed asbestos assessor.